Home Brands Can a Cuisinart Coffee Maker Help You Start the Day Better? Can a Cuisinart Coffee Maker Help You Start the Day Better? Did you know the Turks were the first to roast coffee beans before brewing coffee? Apparently, other cultures just boiled the coffee fruit and some even the stems of the coffee plant. History has it that Sultan Suleiman the magnificent loved coffee so much that if ever there was an appropriate modern addition to his court it would have to be a Cuisinart coffee maker. Cuisinart is a leading home appliance brand with tentacles in every conceivable kitchen equipment including coffee makers. What started as a foray into creating a reliable food processor in 1973 morphed into one of the most recognized and respected home appliances brand in the world. Now, Cuisinart coffee makers are among the best coffee making machines at an affordable price. There are numerous features that Cuisinart has incorporated into their coffee machines as a standard which resonates with consumers. This control allows you to enjoy a cup of coffee mid-brew. It is a thoughtful function that makes it possible to grab your coffee on the run and leave the rest brewing for other family members. While it is convenient to do this, it is important to note that it is best to let all the coffee brew before partaking. This is because caffeine is extracted earlier in brewing so you may affect the quality of the brew with mid-brew dashes. The pause mechanism will automatically kick in when you remove the carafe from the heating plate during brewing. This attribute makes your Cuisinart coffee maker work for you. It allows you to program your coffee maker the night before to prepare your coffee at a certain time in the morning. Come morning you wake up to a brewed cup of coffee. A Cuisinart coffee maker is really easy to program, too. To be honest, this element should be a must-have on any coffee maker for safety purposes especially if it is programmable. Cuisinart as a brand is big on safety on appliances and has this feature on their coffee makers. Once a Cuisinart coffee maker has finished brewing it automatically shuts off the machine as programmed. You can program it to shut off immediately after brewing (advisable if you are solo) or within two hours if you have a family. Cuisinart coffee makers have an excellent filter system that ensures the water remains pure resulting in a smooth cup of coffee. They have two permanent filters; charcoal and a gold tone filter. To be honest he gold tone filter allows some of the coffee oils and compounds which studies have shown cause high cholesterol to pass through. Unfortunately, these oils and the small micro granules that also find their way through the filter are responsible for giving the coffee the full-bodied taste we so enjoy. Any coffee maker worth its salt should have a self-cleaning button especially if fitted with permanent filters. The self-cleaning function helps remove any mineral deposits extending the service life of the machine. The push of a button is all it takes to get the self-cleaning process in motion. However, there are specific instructions on the manual to makes sure it is done right. Always keep your Cuisinart coffee maker clean with regular cleaning. Cuisinart coffee makers are value for money and are set at low to mid-range prices depending on the model. To understand why a Cuisinart coffee maker stands out in a market saturated with all manner of coffee machines it is important to see where the brand excels. We reviewed coffee makers based on three areas that Cuisinart gives customers premium value: construction, features, and capacity. 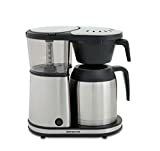 They have ensured every Cuisinart coffee maker has these six functions whether in their most basic form or tweaked with technology: temperature, speed, filtering, brew strength, cup setting, and timer. At the very least this ensures that you can brew a decent cup of coffee anytime. All the models we reviewed are programmable and go the extra mile to provide conveniences like self-cleaning. Cuisinart has a reputation for solid construction of their appliances, and their coffee makers are no exception. We focused on the combination of steel and hardy plastic parts as well as the quality of components like the carafes. Regarding capacity, our review focused on models that can brew one to four cups as well as a higher number. This is the perfect Cuisinart coffee maker for large households that have multiple people drinking coffee. It has a capacity of 14 cups in a cycle, and It brews excellent coffee every time so you can rely on it at any time of the day. The function that resonates with users most on this Cuisinart coffee marker is the adjustable warmer temperature control. It gets coffee back up to temperature quickly when it is needed. The ease of use of this Cuisinart coffee maker has earned it an average 4.1 out of 5 stars customer rating on Amazon. It has a long brewing cycle because the water heating system keeps the water hotter for longer resulting in a longer extraction period. This also ensures that fewer grounds are used. It has the brew-pause feature, so you do not have to wait for the entire brewing cycle to end. 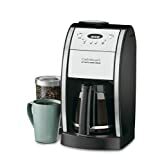 Although other Cuisinart coffee machines have the same three settings to adjust the hot plate temperature, this model's hot plate keeps the coffee hotter. The 3200 has more depth to it which is why it can produce 14 cups despite the regular dimensions. It has a length of 7.8 inches, a width of 9 inches, and is 14 inches high. If you love your coffee beans freshly ground then brewed you will definitely appreciate this coffee maker. This unit not only can grind whole coffee beans but also offers a choice of using pre-ground coffee should you prefer that option. The Cuisinart DGB-550BK is 7.5 inches long, 11.2 inches wide and 15.2 inches high taking up little room on the countertop. For a bean to cup coffee maker, it has a slim and slightly elongated build, and it is primarily constructed out of stainless steel. It has a customer rating of 4 out of 5 stars on Amazon owing to its versatility with the grinds and how easy it is to clean which is a requirement after every grind. The grinding chamber and the filter area are separate. This aspect coupled with the stainless exterior makes cleaning the machine fairly easy. The glass carafe can hold a maximum of 12 cups and has an ergonomic handle fitted with a knuckle guard, so you don't accidentally scald your hand while serving. It also comes with the option to brew one to four cups, so you are not compelled do 12 cups when solo. In case you already are brewing for 12 you can use brew-pause to grab a cup mid-brew. It is also fitted with the gold tone filter, so your coffee has a full-bodied taste. It is programmable and automatic, so your brewing is convenient. The ability to grind and brew whole beans for fresh, rich coffee is the main reason consumers love this unit. However, the con is that the machine can be noisy during the coffee bean grinding process. Also, this machine does not have a brew strength option. Coffee aficionados understand that temperature has a vital role to play in the preparation of good coffee. This coffee maker's unique heating system brews great coffee at record time without compromising on taste thanks to the extreme brew function. The additional option for brew strength allows you bold or regular brewing depending on your preference further customizing your coffee. The exterior, including the wide grip thermal carafe, is made of Stainless Steel with a modern, stylish look. The dimensions of this unit are 10.4 inches long, 12.8 inches wide and 17 inches high ideal for any countertop. Its sturdy construction and array of features have earned it an average customer rating of 4 out of 5 stars on Amazon where you can buy it. Not many coffee machines provide you with three temperature settings of regular, hot and extra-hot. This is a unique pro that has resonated well with consumers who love their coffee real hot or extra hot. unfortunately, the push buttons on this machine are not firm enough. The coffee makers space has many offerings which compare favorably or otherwise to Cuisinart. Here is a comparison of the brand's offerings against some top names in the market. The Ninja coffee bar CF097 is much more versatile than our Cuisinart offerings regarding brewing modes. You can get cold as well as hot coffee drinks from this coffee maker. The constructions are far apart as Cuisinart coffee makers use stainless steel and glass while ninja coffee Bar has more plastic parts. When it comes to cleaning a Cuisinart coffee maker has the self-clean button as well as the clean button that indicates the machine needs to be decalcified. The Ninja coffee Bar CF097 only has a clean button that alerts the user of the need to decalcify it. Compared with the Cuisinart DCC 3200 which can keep your coffee hot for four hours this coffee maker can only manage slightly over one hour. On the plus side, it has an in-built milk frother which none of our offerings have, and it also comes with a recipe book. It has excellent functions which include classic brew, rich brew, specialty brew, and over ice brew as well as volume functions like travel, single coffee cup, half carafe or full carafe. Unfortunately, the Ninja Coffee Bar CF097 tends to over-extract the coffee grounds resulting in slightly bitter coffee. Overall this Ninja coffee Bar has more to offer regarding the brews you can enjoy, but our Cuisinart coffee makers trounce it in capacity, construction, and convenience. It has an average customer rating of 4 out of 5 stars on Amazon. This is an improved version of the Bonavita Classic design. The carafe is thermal as opposed to glass which we see on many Cuisinart coffee makers. The carafe can release all the coffee from inside and remain empty which some Cuisinart coffee makers struggle to do because of the lip on the carafe. Speaking of construction, the Bonavita Connoisseur has a stainless steel case just like our Cuisinart coffee makers. However, all our offerings have bigger capacities of 14, 12 and 10 cups compared to Bonavita’s eight cups. The distinct advantage of this Bonavita offering is its straight-forward design. With just one button to operate you can have your coffee brewing in a second. The thermal carafe helps it keep the coffee hotter for longer. However, so do Cuisinart coffee makers with glass carafes not to mention those with a thermal one like the DCC-3750 Elite. It does a great job of brewing excellent coffee because it hits grounds with plenty of hot water quickly. It also heats the water to the correct brewing temperatures before spraying the grounds. Overall, it is an easy to use coffee maker with a solid construction. Our Cuisinart offerings only beat it in capacity and versatility regarding functions. But they are at par when it comes to construction, and the quality of the coffee brewed. It has an average consumer rating of 3.5 out of 5 stars from customer reviews on Amazon. We have pitted Cuisinart coffee makers against a high-end product like Behmor Brazen Plus because we want to see how well the products hold up. Behmor Brazen plus is a sleek coffee maker with a great aesthetic. It has quite some abilities, so you can become adventurous with your coffee brewing. With this model you choose how long to soak your grounds, the water temperature, it has the brew-pause feature and is programmable. This coffee maker got a nod from the SCAA (the Speciality Coffee Association of America) for hitting the perfect temperature for brewing coffee. The construction is stainless steel and BPA free plastic although the carafe is thermal. Compared to Cuisinart’s thermal carafes the coffee tends to cool down quicker in this model. Also, when brewing smaller batches, the Behmor Brazen plus uses more grounds compared to a Cuisinart coffee maker. The futuristic design can take up a bit of room on your kitchen counter. It has a small capacity offering just 5 cups in the petite pitcher. The controls are a bit more complex than the Cuisinart coffee makers we reviewed. Cuisinart trounces the Behmor Brazen Plus in capacity and easy to use controls. It has an average consumer rating of 4 out of 5 stars on Amazon. The best Cuisinart coffee maker to take home is really dependent on your needs. If you are a large family of coffee drinkers, the obvious choice here is the 14-cup programmable DCC-3200. The choice between the 10 or 12 cup DCC-3750 Elite and DGB-550BK Automatic becomes challenging considering both perform exceptionally. However, the DGB-550BK Automatic Coffee Maker Grind wins because it offers much more. It allows you to grind your own beans to brew your coffee freshly. The extra two cups are a plus considering the coffee is freshly ground.